A rich, creamy toothpaste tingles in your mouth and removes plaque and tartar for a sparkling white smile. Unmistakable "Piperita" Mint for intense pleasure and endless freshness. 25 ml size, recommended when travelling. [name] => AQUATIC MINT TOOTHPASTE 25ML. A rich, creamy toothpaste tingles in your mouth and removes plaque and tartar for a sparkling white smile. A "Soft, Cold" Mint taste for a pleasant sea freshness. 25 ml size, recommended when travelling. [name] => CLASSIC STRONG MINT TOOTHPASTE 25ML. A rich, creamy toothpaste tingles in your mouth and removes plaque and tartar for a sparkling white smile. A harmonious "Hot and Cold" note with a delicate, spicy effect. 25 ml size, recommended when travelling. [name] => GINGER MINT TOOTHPASTE  25ML. 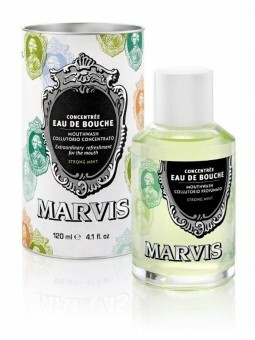 [legend] => DENTIFRICO MARVIS GINGER MINT 25 ML. A rich, creamy toothpaste tingles in your mouth and removes plaque and tartar for a sparkling white smile. The surprising charm of a "Sweet, Floral" Mint taste dedicated to women. 25 ml size, recommended when travelling. [name] => JASMIN MINT TOOTHPASTE  25ML. 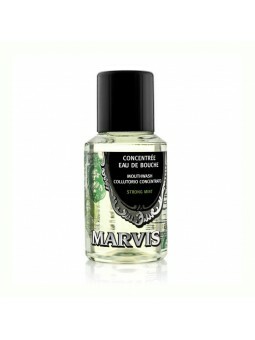 [legend] => DENTIFRICO MARVIS JASMIN MINT 25 ML. 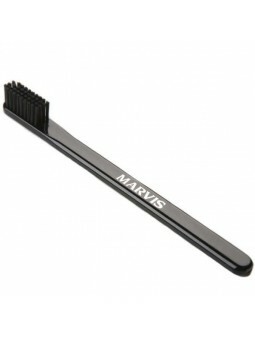 AMARELLI Licorice MARVIS Toothpaste 85ml - The pleasure of flavour. A rich, creamy toothpaste that offers a tingling sensation and removes plaque and tartar for a sparkiling white smile. Co-operation with the Amarelli firm, producing liquorice since 1731, has given rise to an elegant aroma that combines the clean, seductive flavour of liquorice with the freshness of mint. Marvis Aquatic Mint Toohpaste 85ml. A rich, creamy toothpaste tingles in your mouth and removes plaque and tartar for a sparkling white smile. A "Soft, Cold" Mint taste for a pleasant sea freshness. 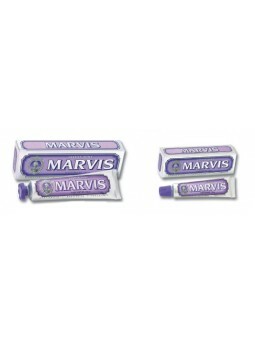 Marvis Cinnamon Mint Toothpaste 85ml. The pleasure of flavour. A rich, creamy toothpaste that offers a tingling sensation and removes plaque and tartar for a sparkiling white smile. Cinnamon's exotic sweetness is enhanced by the refreshing taste of mint in a surprising, long-lasting aroma. Marvis Classic Strong Mint Toohtpaste 85ml. A rich, creamy toothpaste tingles in your mouth and removes plaque and tartar for a sparkling white smile. A "Soft, Cold" Mint taste for a pleasant sea freshness. 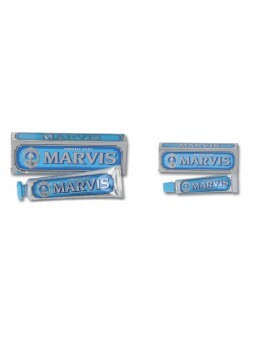 Marvis Ginger Mint Toothpaste 85ml. A rich, creamy toothpaste tingles in your mouth and removes plaque and tartar for a sparkling white smile. A harmonious "Hot and Cold" note with a delicate, spicy effect. 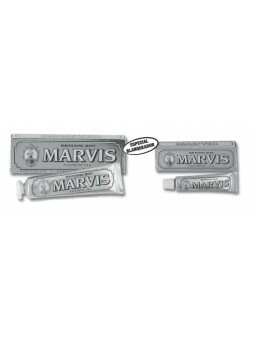 Marvis Jasmin MInt Toothpaste 85ml. A rich, creamy toothpaste tingles in your mouth and removes plaque and tartar for a sparkling white smile. The surprising charm of a "Sweet, Floral" Mint taste dedicated to women. Marvis Karakum Toothpaste Limited Edition 75ml. An incredible trip by the extreme limits of the old continent: from the Black Sea to Persia, going through the Mongolia desert, to the Eastern borders of China, discovering the exotic vibrations of cultures from the beginning of times. Wisely mixing aromatic spices and subtle flavours, that burst into elegant colours and unforgettable flavours. The excitement of an imaginary trip through the Black Sea to Persia, from the Mongolia desert and Eastern China is magically mixed in a toothpaste with a sophisticated flavour that combines the finest peppermint with the sweetness of orange juice, together with the captivating and aromatic cardamom, a rare oriental spice that creates a long-lasting feeling of fascinating freshness. Marvis Rambas Toothpaste Limited Edition 75ml. An enchanted trip, discovering new worlds and cultures, where sharp and bold colours are combined with the fascinating music, sense of rhythm, dances and laughter in an exuberant tropical forest. Surprising places and atmospheres provide the unusual mix of great smells and flavours. Inspired by beaches and exotic atmospheres of Tropical Islands. The Rambas toothpaste has a flavour made of velvety fruit that combines peach and pineapple with a sweet mango Alphonso touch. A rich mint aroma that creates a long-lasting sensation of vibrant freshness. 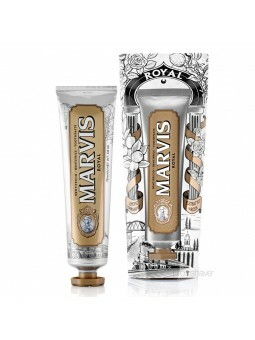 Marvis Royal Toothpaste Limited Edition 75ml. Splendid and luxurious travels that offer a surprising view of the world: from the capitals of culture to the most elegant European architecture and the most incredible Eastern markets. Sweet fragrances and warm colours creating astonishing feelings. Elegant and luxurious trip on the Orient Express inspired in the Royal Toothpaste, with a unique and sophisticated flavour that combines an Italian oil of spicy lemon and tangerines. Fragrance of extract of rose and nutmeg. This combination enhanced with mint creates an exclusive sensation with a stimulating strong flavour. 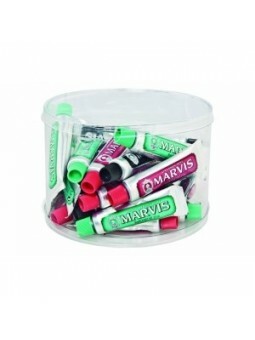 Marvis Whitening Mint Toohpaste 85ml. Rich and creamy toothpaste giving an intense taste sensation. Removes plaque and tartar while whitening the tooth enamel to make your smile even brighter and more beautiful. The ice shiver produced by the "Cold" mint leaves you with a lasting taste and unforgettable freshness. Rich and creamy toothpaste giving an intense taste sensation. Removes plaque and tartar while whitening the tooth enamel to make your smile even brighter and more beautiful. The ice shiver produced by the "Cold" mint leaves you with a lasting taste and unforgettable freshness. 25 ml size, recommended when travelling. [name] => WHITENING MINT TOOTHPASTE 25ML. Marvis AQUATIC MINT TOOTHPASTE 25ML. Marvis CLASSIC STRONG MINT TOOTHPASTE 25ML. Marvis GINGER MINT TOOTHPASTE 25ML. 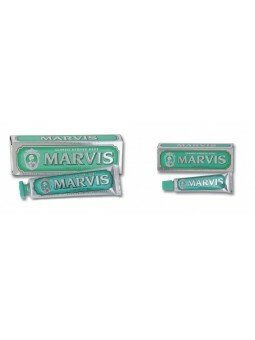 Marvis JASMIN MINT TOOTHPASTE 25ML. Marvis WHITENING MINT TOOTHPASTE 25ML.